Candy Apple Cafe & Cocktails updated their menu recently, and I was lucky enough to get invited out to taste some of the new items! 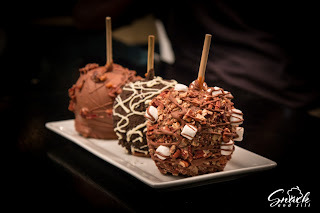 I was a fan of Candy Apple before, so I was very excited to see what they had on the new menu. 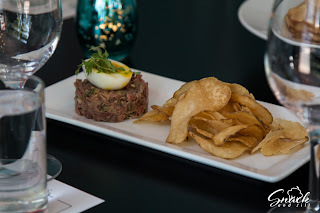 I was very pleased to see that they kept a lot of the old favorites while adding a lot of new dishes. When we arrived, we were treated to a cocktail hour on the patio. We were able to sample their new cocktails, so I opted for the Bourbon S'mores (housemade chocolate infused four roses bourbon, kahlua, kerry gold irish cream, milk, demerara syrup, marshmallow fluff). They aren’t playing around with these cocktails, it was strong! It had a dessert feel to it and would be great for an after dinner drink. I also had a Mimosa Popsicle (regular and the cranberry version) and yes, both were as amazing as they sound! 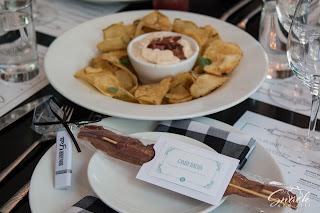 After the cocktail hour, we were seated inside and treated to our first course, a few different appetizers and some candy bacon to take home! Next, a choice of soup or salad. 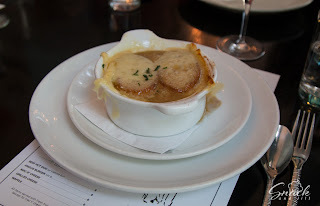 I chose the French Onion Soup (sherry, caramelized onions, gruyere - GF w/out crouton) since I’m a big soup fan. When it came out, I was amazed with how cheesy it was. I love cheese, so I was pretty excited about this. The cheese was so plentiful that it lasted until the very end of the soup. It had real staying power. 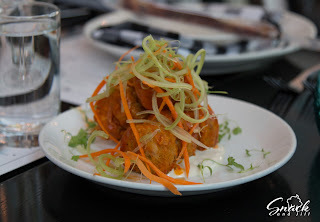 The Buffalo Chicken Croquettes (house made blue cheese, franks red hot, shaved celery slaw) were pretty unique. They were minced chicken formed into a patty, then cooked. I loved how they had a little kick from the buffalo sauce. It was a great dish and a perfect appetizer. 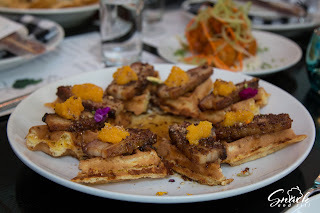 The Pork Belly and Cheddar Waffle (mustard glaze, apricot preserves) was a very unique dish. The pork belly was cooked beautifully and the waffles were nice and crisp. The apricot preserves added another layer of flavor to the dish. This was a huge winner at our table. Our next entrée was one that I was really hoping we would try, Wild Mushroom Risotto (sage beurre noissette, shaved reggiano - VA w/out reggiano) I am a huge risotto fan so this one was calling my name, and I’m happy to say that it did not disappoint! 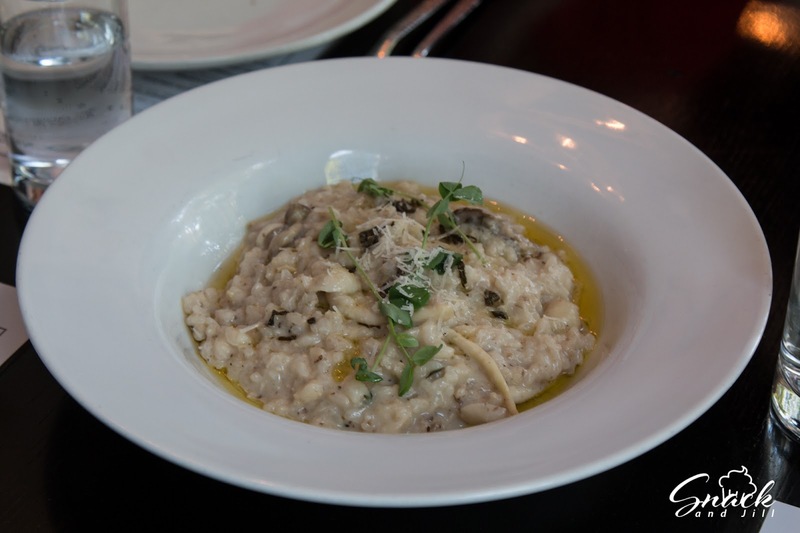 The risotto was very cheesy and the mushrooms added a nice contrast of flavors. 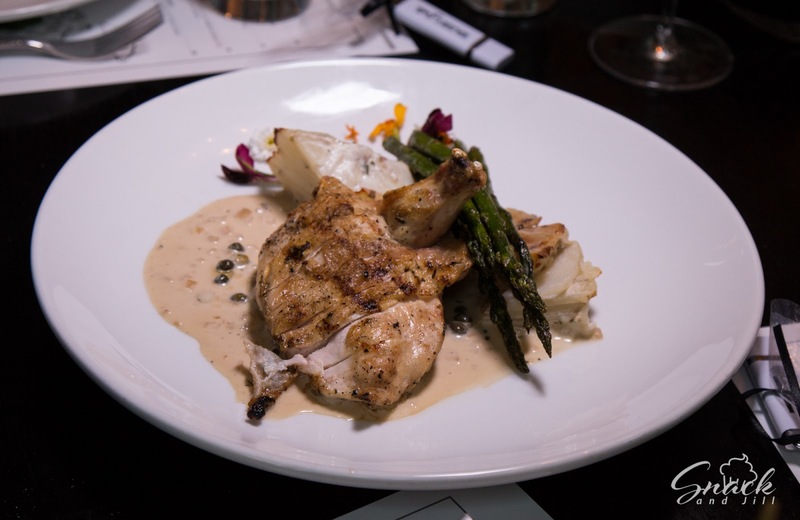 I can definitely see myself coming back for this dish. 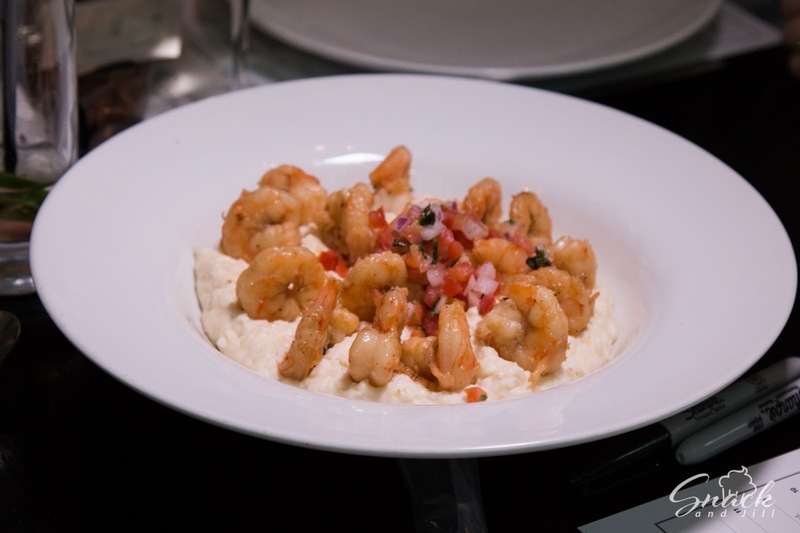 Mayport Shrimp and Grits (creamy greenway farms stone-ground grits, sautéed mayport shrimp, tomato relish). 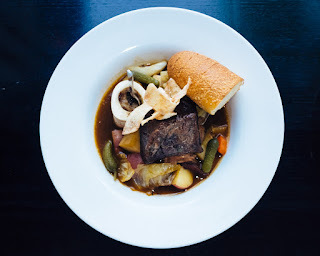 The Short Rib Pot-Au-Feu (oxtail, bone marrow, celery root, cornichon, toasted baguette - GF w/out baguette) came out next. 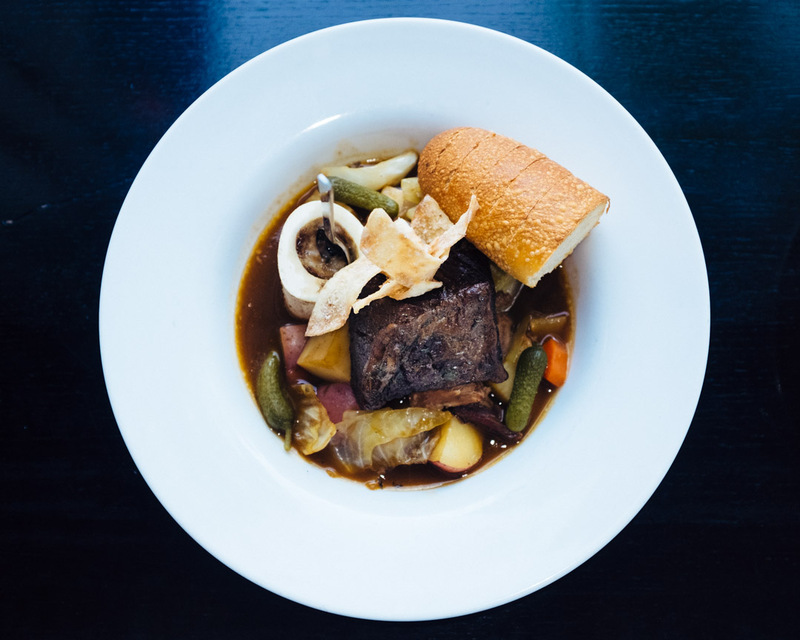 The meat was very tender and flavorful. 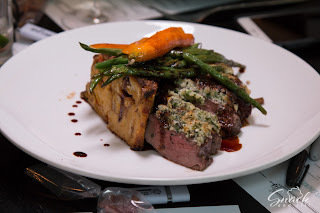 Char Grilled Filet Minon (savory brioche bread pudding, wild mushrooms, roquefort, grilled asparagus). The steak was really tender and I loved the cheese on the top. We were all stuffed, then the desserts came out and miraculously we all found room! They brought out their Ginger Carrot Cake and Orange Cheesecake. 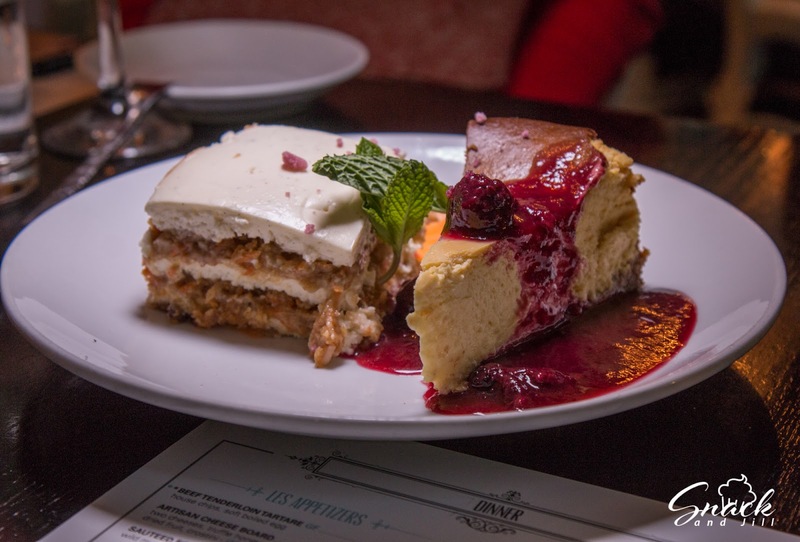 I passed on the carrot cake, but I did try the cheesecake. It had a mixed berry compote drizzled over the top and was loaded with orange flavor, but it was not overpowering at all. It was just the right about of orange. And of course, candy apples! I have always been a Candy Apple fan, but I am really excited for this new menu. One thing I also wanted to point out is that they serve their brunch menu all the time, not just on the weekends during brunch! That is a huge selling point to me since I’m always craving brunch food at weird times. Another awesome thing about Candy Apple is that they are attached to Sweet Pete’s. So when you get done eating, make sure to wander around and check out all of the delicious sweets! There is even a room upstairs behind the registers where you can watch the workers making the candy. Super cool! Also, I know some people have hang-ups about downtown due to the parking, so it’s awesome that they have valet. That’s one less thing I have to worry about when I’m eating there.